We’re tired. We’re stressed. We’re hurricane-weary and hash-tagged out and mad as hell and we’re not gonna take it anymore. So I’m sitting at the Panera reading my paper in Wilmette, Illinois on the first frosty morning of Autumn when I notice bands of purple people bedecked in ski caps and scarves and gloves, marching in for their takeout coffees and vanilla frosted cinnamon buns. That can mean only one thing. Northwestern home game! If you’re a New York Giants fan your season is already over (and if you’re a Yankees fan you’re so sick of sports you’re thinking of learning new hobbies!) But the crisp cool air, brilliant blue skies and the thought of an utterly meaningless football game for which I had no rooting interest, appealed. So I hopped on my Schwinn, pedaled 10 minutes to the stadium, and scored a ten-dollar ticket from a fan at a tailgate party. Wildcats-Cornhuskers Big 10 football. In real life! Sometimes it is nice to remember the simple pleasures. You get up at daybreak. You've swept across 18 time zones in five days and it takes a moment. You're in Amsterdam. The morning light is reflecting off the canal outside your window. You hit the fancy coffee machine in the hotel lobby and enjoy your double espresso/no milk thanks ('cuz you can't find any). Your wife is sleeping in. She has presented on three continents in less than a week. Sleep 'til noon, my love. It's Saturday morning. I've got this. A few quick questions and you find yourself on the #13 tram toward Westerkerk. None of your chip cards work for the fare. The driver lets you go, anyway. When is technology not confounding? You get off by the queue of tourists at the Anne Frank House and keep walking until the streets are weekend quiet again. You are in the Jordaan (not Jordan, Yoordin!) district. You've heard it's hip. You follow the old lady with the Dachshund, canary yellow tote bag on her shoulder. You see the row of panel trucks before you hit Lindengracht. As many times as you have done this, you still feel your heart quicken, your pace pick up. You've found what you are looking for. You walk past the rows of bicycles and wade in. Notwithstanding the fact that the guy hawking the sunflowers looks like he was cast by Van Gogh, you sense that you have walked into the original script for farm to table consumption. Everyone seems to know everyone. There is great passion about the mackerel, drama about the cheese. My roots are non-agrarian. I think you can go back three generations and not find a potted herb! So why this fascination with food I find out of doors? There is something about the freshness of it all. The colors, the smells. The arrangement of the products, the bustle of the trade. I suppose it is like theatre, only with food as the stand-in. You'll find the same themes wherever you go and yet it feels new and exciting, every single time. You're thinking about a second coffee, maybe a croissant. Your wife should be stirring. The restaurants are opening, people are up and about. You tuck your phone in your blue jeans pocket and start walking back to the hotel. On my first trip to Asia a long time ago, I sat next to a professor who was on his way to Borneo. I didn't even know there was really a place called Borneo! I thought it was something from a Bugs Bunny & Roadrunner cartoon. That trip was an eye-opener. So, Jakarta. 10 million people. Infernal traffic. Gut-wrenching drivers. Oppressive smog. Stifling heat and humidity. I love Jakarta!!! Granted, it's not for everyone. The beaches of Bali beckon to the south, but Bali does not need my services. The World of Exotic Destinations is rapidly getting squeezed like an old rind. Everyone's been everywhere and mostly done everything. That can't be said of Jakarta. I had a day to myself and enlisted the service of a driver and car. My guide, Kelik, barely spoke a word of English. Which is exactly one more word than I spoke of Bahasa Indonesia. For the next five hours we communicated beautifully, bonding over our kids and family and the most pedestrian of matters. I said I had an interest in food markets. He took me to Kramat Jati, a commercial marketplace in East Jakarta. If it has undergone photosynthesis, you will find it here. I was the only Westerner to be seen in the teeming marketplace and everyone seemed interested to see me – or ignore me. Mostly I assume they wondered why the heck anyone would be wandering through their office taking pictures of fruit! Garlic, onions and peppers were hot items. I know there are 10 million people in Jakarta, alone, but the amount of food flowing through this hall being packed, peeled and processed is staggering. I asked Kelik about meat and and fish. We hopped back into the car and wove our way deep into a local neighborhood. I thought maybe I had mis-explained myself until he parked in front of a shopful of air conditioners and led me into a back alleyway that he explained was a "traditional marketplace." Basically, the Safeway! And the meat was plenty fresh. No worries about checking dates on the plastic package. The exotic sound of the midday Muezzin in the tropical heat was a stark reminder that I was a long way from home. But I was at someone's home and that is what travel has always been about for me. Food is language. Follow the local ingredients and inevitably you're going to stumble upon people with whom you have something in common. Garlic and spice is the international dialect. If you're fluent in that, I find, it seems you're always welcome. For those of you who have coached kids' sports, you might recall this phrase a little differently. If someone got beaned or had a rough collision, everyone on both sides of the field had to take a knee, while we attended to the injured player. It was a sign of respect, for someone who was hurt. I joined my wife in DC last weekend. She spent the lion's share of her Saturday and Sunday running workshops for volunteers from Africa gathered for a conference dedicated to the continuing fight against HIV/AIDS. My wife walks the walk. Very inspiring. It being Father's Day and none of my kids in sight, I decided to have a peek at my old stomping grounds. Take the temperature, as it were (which was about 95 degrees by the way). I wandered out of my extremely groovy hotel and hopped on a Capital Bikeshare ride (CBS as the locals refer to it; eight bucks and you own the town) and set off on a three-pronged agenda. Stop one was fine dining at Ben's Chili Bowl, the original, naturellement, on U Street in NW. Not only was the food sheer culinary bliss, destination dining at its very best, but I was lucky to see one of the founding owners, Virginia Ali, still working behind the counter, purse hanging off her shoulder. This is a 60-year old family run business and a DC institution that has served everyone from Miles Davis to Barack Obama. Fortified, I peddled off to my next stop. With a full belly, I felt the need for a full heart, so I wheeled down to the Vietnam War Veteran's Memorial. The place can captivate you even in a driving sleet storm on a winter's afternoon. I was not prepared for the emotion of visiting on a crowded father's Day in the June heat. The pictures speak for themselves. We can't thank these guys for their service. But their kids still do, 50 years after the last men and women left Vietnam. I followed the path from the Memorial to conclude my tour at the reflecting pool – a place that brings back my earliest childhood memories with my mom and dad – not to mention a fleeting black & white TV image of hundreds of thousands of 60s protesters, long before we had social media to make ourselves heard. Martin Luther King, Jr. had a dream here. You can stand on the steps of the Lincoln Memorial and imagine it all happening. We still have so much to say. A closing surprise. I have a friend – a mountain climber, humanitarian, and global ambassador of human decency named Timmy O'Neill – and in a city of 650,000 we actually ran into each other in front of a bike rack by the Memorial. Among other things, Timmy founded an organization called Paradox Sports that leads people with physical disabilities on insane climbs, thrilling river passages, and the such. No one has ever taught Timmy the meaning of defeat. I don't think he even knows how to spell n-o. In trying times in a divided nation, what can be more inspiring than stealing a hug or two from a guy who leads blind climbers up El Capitan. I was wiped out from the DC heat and humidity and my hotel was three miles back uphill. Like I was going to wuss out and take a taxi after that chance meeting? As I crammed into the elevator with a half dozen people for the ride twelve floors up to my Manhattan office it was hard not to notice that every last person was frantically tapping away at their phone. It was a heady reminder of why I went out on the road. Before a phalanx of critics shriek hypocrisy and remind me that I Instagrammed my entire trip, allow me to suggest that I am not a luddite and we can peacefully coexist with these technologies and the world around us. My purpose was to get outside of the screen, put New York in the rearview mirror, and see how we were doing out there. The other reason I was craving America was most assuredly political. Like so many others, I felt like my brain was being ground to databyte-sized sawdust by the onslaught of bad news. Nothing felt real and it seemed like there was no escape. So I did. I am married to a scientist. I understand that five days and a handful of conversations doth not a scientific survey make. On the other hand I am a writer and my unique professional skill is observation. Do I know there is anger and racism, hatred and division hiding around every corner? You bet. That's not what I went looking for. I just wanted to see for myself – a random straw poll if you will – how America was feeling during these turbulent times. Here's what I learned. Always, first and foremost, people can be good – and friendly, civil, and curious. Order a grilled shrimp po'boy at a rural Lousiana roadside shack and mention you are from New York and you will draw a crowd. The kids who worked at this cafe happened to be recovering addicts brought together by a charitable organization. We talked for an hour. The sandwich was delicious, their sense of hope elevating. I learned more from them about the pain of addiction than I have from the last 50,000 words I've read on the opioid crisis. In Artesia, New Mexico, over the best green chili stew and spicy pork adobo I have ever tasted, my waitress Patty enlightened me about the desire for work and the realities of immigration. Maybe all diplomacy should be done over local food in a roadside cafe. The enchiladas were delicious, too. Is it all fall-off-the-bone tender ribs and roses out there? Nope. I saw plenty of desolation on the great American two-lane. I could go back tomorrow and start tracing the history of every cinderblock shack that began as someone's bright tomorrow and ended up a page of weather-splintered history, a footnote to a simpler day. When I travel like this I take a lot of pictures, plenty of gravel-strewn U-turns to capture something I saw going by in a blur at 60 per. A back roads road trip is a window into how people live somewhere you don't. I saw in people's front yards: oil rigs, cattle, cotton fields, 18 wheelers, a llama – every single rusted out first car you drove in high school! The list goes on and on. There is always one photograph that got away and this time it was a little boy in rural Alabama one late afternoon. He must have been 12 and he was dressed in full Little League uniform, hitting balls off a tee all by himself next to the rundown doublewide that I assume he called home. Don't know where his team was, don't know where his folks were. This happened to be the day of March for Our Lives. I'm still thinking about that kid, that image. I hope he got to play. I started out each day with my Rand McNally spread out next to my coffee, juice, eggs, toast and sausage gravy. Just the sight of an actual road map started plenty of lively dialogues. People were mesmerized by the analog-ness of it all and everyone had a recommendation. There's always one more road to be explored. Maybe therein lies the beauty of the trip. It's not what you find out about people, but how much you don't know. The Internet has given us access to everything, but you can't GPS dreams. Give someone fifteen minutes. Trust me, they've got one. It may look like just another intersection in a faceless Texas town, but this is where my imagination was born. I was 12 years old growing up in New York when I first saw the film. I'd never been west of New Jersey! And then I met that place and those characters. Sonny and Duane and Sam the Lion and Jacy and Ruth Popper – god, they were larger than life to this suburban kid. When poor Billy and his broom met up with that cattle truck in the very intersection pictured above, I was wrecked. So no surprise, when I found myself in North Texas yesterday I had to go see where it was filmed. If you know North Texas (or most of Texas for that matter), these small towns never change. Neither had Archer City. I walked the fabled two blocks clicking away and drinking in the breeze rolling off the scrub grass plains. I noticed the small storefront library was open. I had questions that needed answering. 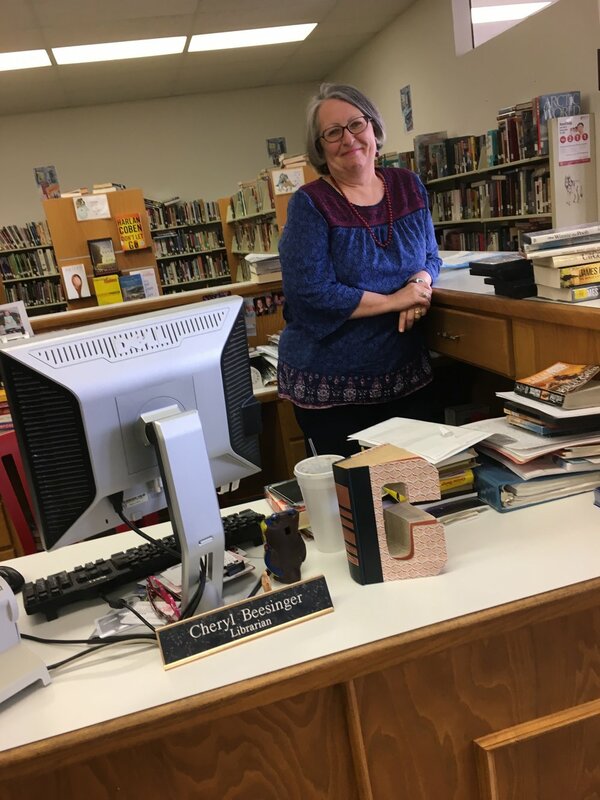 Meet Cheryl, the town librarian for the past 40 years. The wall of Sam's Cafe still stands, though it's been closed for 20 years. A kindly old gentleman with a deep Texas drawl told me they had the best burgers in town, though they could have used a table or two more. Larry McMurtry, who wrote the original book, not to mention Lonesome Dove, Texasxville, and about 30 others, went to Archer City High School and the town is rich with the real stories that became the movie. He still has a place nearby and owns a couple of bookstores in town. Unadorned and simple, same as Archer City. Cheryl told me stories about "Larry" and the townsfolk, but she might as well have been talking about Duane and Sonny and Ruth themselves. I was transfixed. I asked how many people came traipsing through on a Last Picture Show pilgrimage. She said about one a day, a few more in the summer. Cheryl was an extra in Texasville, but her scene ended up on the cutting room floor. I told her I'd read "Eddie & Gardenia" – a book about a boy and his goat on a West Texas ranch – about a thousand times as a kid. She reached under the checkout desk and pulled out an Archer City library bag as a gift. Then she disappeared into the back of the library for a moment. As I waited for her to return a tow-headed boy with a backpack clattered in and set up shop. He pulled out his schoolbooks and started his homework. Cheryl came back with a book in hand. It was the last installment of McMurtry's Lonesome Dove series. "I'm sorry Larry's not here to sign it for you," she said. Then she grabbed her Archer City Library Book stamp and firmly marked the front page. "There you go," she said. "Now you have a book from the Archer City library." "Any fees if I return it late?" We both laughed. I shook her hand but felt a deep urge to give her a hug. I held that thought, as well as the tears welling up in my eyes. I glanced at the boy as I walked towards the door. I'd guess he was about 12. He could have been me, head buried in his book. I stood at that intersection where a cattle truck had brought Sonny and Duane's youth to an end. It was just a location in a movie scene. It was also the crossroads in my life where a kid from New York's writing life began. There's nothing amazing about the fact that I'm planning to see the entire United States coast to coast back roads only in the next 5 days. What is amazing is that I was able to navigate the streets of Lubbock, Texas without a phone or GPS and come back with a delicious sack of Cane's Chicken Fingers, thanks to the kind recommend of the gentlemen at the front desk of the Hampton Inn. We are so used to putting our lives in the hands of a piece of technology. What fear I felt getting lost between the east and southbound 289 loops without my iPhone to get me home. What joy I took putting my dinner in the hands of a kid named Henang. The chicken was delicious. Sometimes it's good to deal with humans. That said, I haven't seen a whole lot of them since getting off the road at Las Cruces. When you go up into the mountains of southern New Mexico it is like a national park, pristine green trees etched against a brilliant blue sky. As the road descends from 9,000 to 2,500 feet you blend into gentle waving grasslands. Then within a matter of moments the smell of petroleum hits you. Eastern New Mexico industry blends with West Texas oil and the cattle enter the picture. There is nothing unusual about seeing an oil rig pumping next to the water hole where the cows have come to roost. In Artesia, NM I was the last person at the lunch buffet at La Fiesta. Patty, the owner's daughter, has never been to New York. She works too many hours covering for her parents to take the time and business is not reliable enough to hire others, she said. We talked about the hard work of roasting sack after sack of green chilis from Reza's farm a few miles up the road while cooking and serving shifts and raising her children. La Fiesta has been there for 40 years. I asked her what people do in Artesia. She said not much. But it's a good place to raise a family. We laughed a lot about our sports-obsessed sons and she refused to let me pay for lunch. I left her ten bucks. It was nice to chat with someone over green chili stew. America was feeling pretty darned good to me. I'm making this drive because I wanted to feel the wheels beneath my feet and see real things and meet real people. No need to recount the day's bad news. I'm heading into day 3 of my journey and no one has spoken a word of politics. I've seen a cowboy pulling barbed wire on the side of a Texas farm road and driven through a town called Hope that was completely boarded up. Outside of Denver City, Texas I laid my Rand McNally on the hood of the car to map out my route for the last few hours of the day to Lubbock. The warm sun beat down on my head. A man in an old minivan full of young kids paused before he climbed in. "I haven't seen one of those in years," he said staring at my atlas. "Yeah, I'm just kinda picking my way across the country," I said. He scratched his chin and cocked his head at me. "A road map. Man!" he said. "Well y'all have a good trip." "I will," I said. "I am." If you've got 'im, you get it. They come home from college. They spread out over every square inch of the house (and if your home is a small New York apartment, this is especially...cozy?) If they happen to be a 6'1" teenaged boy, they eat you out of house and home. This occurs at least six times a day. Chargers grow out of every outlet. The couch and the remote become Winter Break Central. Dirty laundry is a viral affair. And your wallet is a direct conduit to parental communication. Just say "sure!" So why, after three, starting-to-seem interminable weeks have crept by, would you ever offer to drive your kid back to college in upstate New York – via Maryland, North Carolina, West Virginia, Kentucky, Chicago, Cleveland and 2,500 miles in between!!? Because you love them to pieces. And even though they're all grown up and on their way to greatness, they're still your kid. Which makes the 79 hours in the car, two college basketball games, seven sacks of burgers, 3 lbs. of Twizzlers, and in-depth analysis of every sport ever played since the first Greek Olympics in 776 B.C., worth every single mile. I only cried for the first 10 minutes after we said s'long. One day I'll get better at this. Okay. Probably not. The original incentive was to re-live our minor league baseball road trip from many summers ago. We drove 576 miles for a pre-game feast. Closed due to a snow "state of emergency" in North Carolina. We soldiered on. Wheels by Enterprise. Late nights & early mornings by Hampton Inn. Great customer service counts. Pay dirt on both scores! Somewhere in Kentucky. The back roads are still analog. Halfway point. Chicago. Benefits of a commuter marriage. Perhaps it goes back to my love of the Ezra Jack Keats classic, which I read over and over as a child, and then as an adult reading to my children. I have always loved snow. I moved back from L.A. to New York in my 30s because I grew weary of getting depressed watching east coast blizzards on the west coast evening news. In fact, I keep my emotional barometer calibrated to three constants that have persisted all my life. Airplanes. Spaghetti. And snow! Update: I'm feeling pretty darned toasty, today. Berkeley Place. Park Slope, Brooklyn. Shake Shack open for business. And then of course, after all the talk and build-up and excitement that comprises a New York "snow event," the sky lifts, nightfall comes, the temperature drops, and it's over. By the next morning, New Yorkers will be going about their business. "Cyclonic bomb?" What bomb? It was just...a snowy day. Why not an artsy foreign film? It began with the tentative fumblings of name tags with pictures – photographs from a lifetime ago, hanging beneath the faces of people we had not seen for years, maybe decades. We queued up for drinks and clung at first to the familiar – spouses, and the friends we had remained close to. There was almost a stutter step beginning to the affair, but then slowly, the room filled and exclamations of recognition slipped into conversations, and soon, laughter, hugs, and klatches of people truly glad to see one another again. Whatever old boundaries once existed, vanished in the remembrances we had created in the hallways where we first started to find ourselves; where we began the journey of discovery that is high school. As disparate as our lives and geographies have become, I was taken by what we shared this weekend. Faces and figures were softened by time and yet the stories we told were as sharp as if they had happened yesterday. Long ago friendships blurred into a group affection, paused only briefly into silence as we watched a tribute to those who had passed. We collected our thoughts and moved on and the evening refused to end. 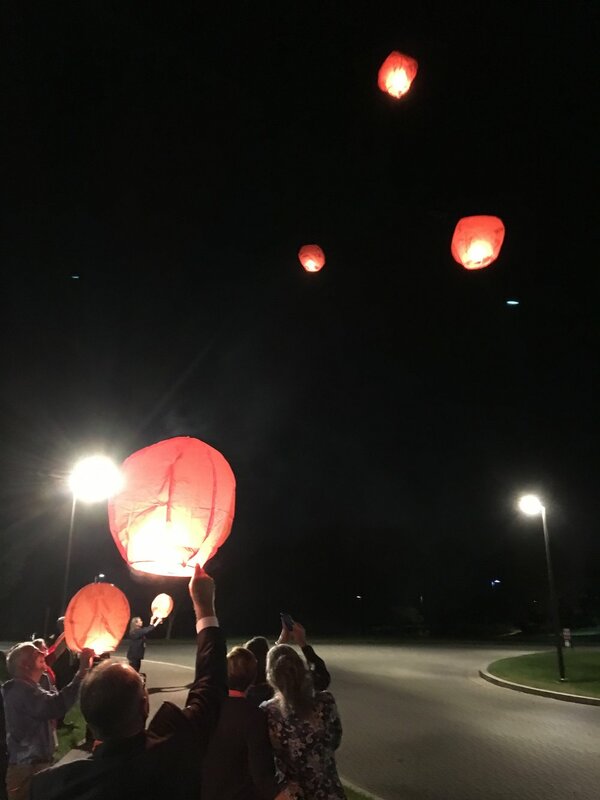 When the hotel announced it was over, we moved outside and released orange crepe lanterns fueled by flames into the night sky. The silence was palpable. For a moment we were alone with our thoughts. By brunch-time Sunday morning it was no longer a reunion, just lifelong acquaintances getting to know one another a little better. We traded emails and business cards and promised we'd do it again. When I sat down to pen this column I intended it as a thank you to our classmates who put this all together and did such a flawless job. But now, back home on a Sunday night in Brooklyn, the gratitude feels wider. I helicoptered into Maryland as a nervous 9th grader on an uncertain path. This weekend, I realized we all were in the same boat. For all the reminisces we traded over the past two days, it's clear that those four years at RHS delivered so much more than memories. We were blessed with friendships, that time and age and the inexorable pace of change have done nothing to fade. Hard to imagine the last time I tended to this was in a snowstorm in Nebraska. Fast forward to a beautiful morning in July. My wife is sound asleep at dawn. I stroll out on the skinny verandah of our hotel, five floors above the city of Vichy. A smeared line of sunrise paints itself across the morning clouds. I stare for the longest moment, throw on my jeans and climb into the tiny lift that cranks itself down to floor zed. It seems like so many years ago I used to take to the street with two cameras strung around my neck (one for black and white film, one for color). It's easier to capture images today. So why does it sometimes feel so hard. A week ago Saturday I marched with 400,000 people down Fifth Avenue in New York. Sunday morning, while enjoying a stroll through weather.gov, I saw a nice storm system brewing out over the Rockies and picking up speed heading east. Thanks to a large number of frequent flyer miles and a twelve-dollar-a-day rental car, I was able to get to Denver to go experience a two-lane highway I had traveled once before, and promised myself I'd re-visit someday in a blizzard. The images below are as surreal and otherworldly as they seem. I returned to New York to learn that we were closing our door to strangers. Over the course of my journey, I experienced nothing but kindness. We pushed one another's cars out of snow banks, made buckets of chicken noodle soup in the Quality Inn when all the restaurants closed, and shared whisky, stories and laughter as the storm blew through. No one closed any doors. There didn't seem to be much need to "make America great, again." We were doing just fine. "I'm mad as hell and I'm not going to take it any more." "Can't we all just get along." So much came out of Saturday, I'm surprised we didn't break the Internet. (Can you do that?) I decided to post just a few pictures because we were there – my wife and younger son and I – and I loved that Matty felt like he was a part of history. I think everyone did. But even more hopeful, so many issues got voiced that it felt like we were witnessing a beginning, not just a moment in time. Now I find myself wondering where we go next. I am glad I am not alone. Everything changed. New home. New subway stop. New slice. New Chinese. These are the facts of life in New York. You move a dozen blocks and your palate has to readjust. But we are NYers and we are tough and we survive. As I scrolled through the "Past 12 Months" on my iPhoto selecting my favorite shots for this column, I realized the food tells a story. It's about travel. And my kids. Family and friends. Work and play. The joys and the struggles. Plenty of both. I logged 86,000 air miles last year, made at least four 2,000 mile+ drives, and probably spent more time away, than at home. And yet I cooked. More than ever. Especially when it became apparent that I was going to have to move. People always seem surprised that I prepare full-blown meals for myself nearly every night of the week. Steak tartare and Rachel Maddow got me through more tough days than I can recount. In the end, those midnight meals fueled my passion and soothed my soul. And looking back, told a story. Here it is. Old-fashioned guy still worships print. I save each issue for LGA-ORD. Puts me in a good mood every single time. Three-oil scallop carpaccio. Seafood from Flatbush Ave. by the Q. Seasoning from a trip to South Africa. "The Rosie" from Conte Di Savoia Italian grocery store near UIC. I plan my flights to Chicago based on arriving in time for lunch. Seven dollars of pure joy from Sunac deli in Chelsea near my NY office. We got 12 amazing years out of a postage stamp-sized Brooklyn brownstone back yard and a Weber. I'll miss whipping up impromptu steak frites. Fairway mini moon pies. Impossible to eat just one. Cafe Batavia in Capetown. Mobile office and birth of a new novel. Summertime, dear friends, and of course the mandatory oyster stop on our annual Il de Re family bike ride. Salt and pepper calamari. Ben's favorite. Recipe cribbed from Joe's Shanghai. Kimironko day market in Kigali. The original farm to table. Comfort food. Because diners are life and I still remember Schraffts. Eggs and warthog at Arnold's on Kloof, because it's where I fell in love with my wife and it's just as good as the first day she took me there. Fresh fish. From my day at sea working on a documentary about the death of the day boat fishermen. I have driven 2,000 miles around America and then, on the eve of the election, jumped on a plane and flew about as far as you can fly. Sitting here on my last day in Capetown, I decided the juxtaposition of a few images might be in order. Read into these images what you may. I am chockful of opinions. It seems plenty of folks these days are. So in the spirit of peace, love & understanding, I figured I'd close with one lasting shot that I suspect will leave everyone with at least a smile from a very tempestuous fall. (Mea culpa Cleveland fans.) I'm heading home. Great food. Delicious wines. Local artisans, nice jazz, sweet vibe. Early summer's day in Capetown. Not much more to add. It was nearly a dozen years ago I walked up this pretty street in the heart of Park Slope, holding the hands of two little boys, a scrawny 4 and 6 years old, my own heart filled with terror. Their mom and I had finally thrown in the towel and agreed I'd be the one to move out and find a new home. I'd moved plenty of times in my life. No fear there. The sick feeling in the pit of my stomach was that I had no idea how to raise two children on my own. "Week on, week off." I get my boys back every other Sunday. This was our home for their entire childhood. The KMB Club we called it. I figured it out and they grew up. Ben is now a freshman at college and Matty is a junior at high school in NYC. They're both taller than me and blessed with an ingrained sense of New York independence. When our apartment's usual coughs and hiccoughs became loud and unmanageable I decided it was time. We gave notice on the heels of a city water main break. Into our basement! There was not even time to find a new place. The decision was made. Pack up. Store. Move on. The emotion of bidding farewell to home, hearth and childhood is palpable. Call it downsizing. Call it an adventure. We made our way once as three guys on a journey and we will again. 12 years ago we moved into 4 large rooms of a bone empty duplex. We leave a lot of memories behind. But we will move on. Starting a novel is a bit like edging out to the end of a high quarry on a hot summer's day, contemplating the 20-foot drop. You're not quite sure how deep the water is. Or what happens if you don't get that slight push off the edge to miss the rocks that are staring up at you, just beneath your toes. Still, we take the plunge. New York has been a steam bath of late. The asphalt is sludge under your feet. The humidity could soak a bale of hay and submerging into the subway is like crawling into a pizza oven. I got home to my block in Brooklyn last night drenched, the sweat literally pouring from my forehead. My mind went straight to...a refreshing cocktail! I have never made a drink from a grapefruit. I have never made a drink with a raw egg. I am not sure what made me think of it, but I decided to try something completely different. A ruby red grapefruit fizz. The ingredients are simple. Exactly what is pictured above. Add ice. Shake vigorously. See what turns out. Sort of like starting a novel. For anyone who is an ardent believer in farm to table, locally grown fresh ingredients, Mirimoko Market is your one-stop shopping spot in Kigali. 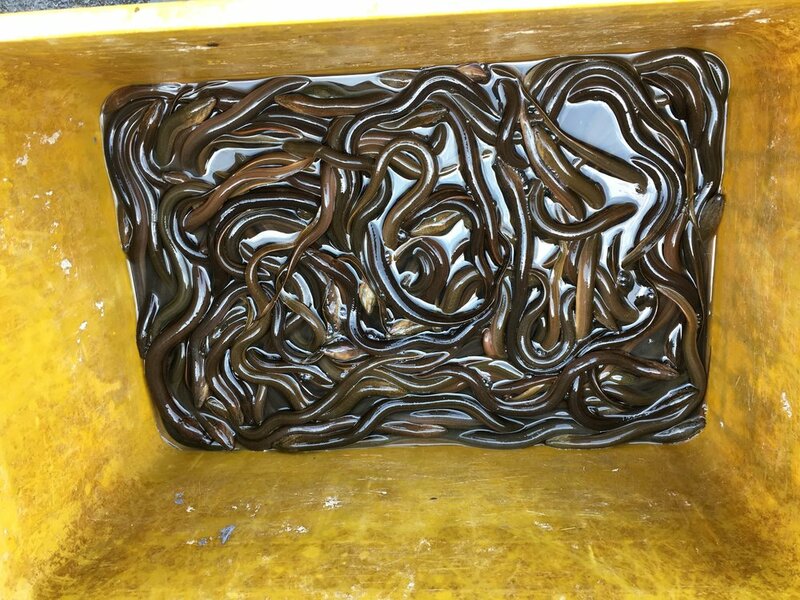 Lake Kivu fish? Ugandan grains and beans? Like your chicken and beef fresh? This is the place! Having just spent four days at the 2016 International AIDS Conference in Durban, South Africa, I could write about the most elite group of global scientists you have ever met under one very large roof. Or I could highlight the inspiring remarks delivered at plenary sessions by the likes of Elton John, Prince Harry and Bill Gates. I could try to explain what I learned about viral suppression, vertical transmission and ART adherence. But maybe it's best that I just share a few faces of the 15,000 incredibly passionate people dedicated to the eradication of HIV/AIDS.